All the latest news, reviews and other assorted doings about BLAM! 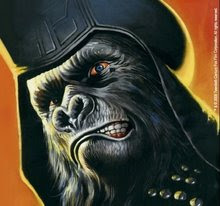 Ventures' Planet of the Apes illustrated novel series. 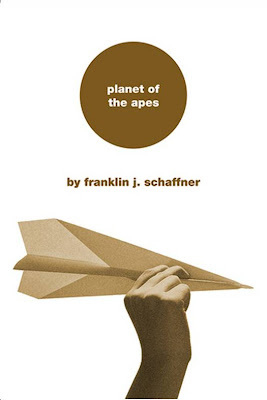 Over at Graphic Nothing's Flickr page you'll find a set of minimalist movie posters, among which I found this one for Planet of the Apes. Some are cool, some are eh, a few are obscure and the rest I hadn't seen the film they come from. Hello! Please feel free to make your comments here. No flame posts, please - if you have a different opinion than the author, feel free to comment, but in a positive and friendly manner. We are all fans here, and all positive discussion can only lead to a new awareness of the potential of our favorite franchise. As soon as your comment is looked over by an admin, it will be approved and posted. Thank you! Go ahead, human, click on me! Planet of the Apes and all related content ™ & © 2009 Twentieth Century Fox Film Corporation. All rights reserved. All other content © 2009 BLAM! Ventures, LLC. Got a question? Need an answer? Let us know! On Facebook? You can use the app to follow us there!